The Chenghua Emperor (Chinese: 成化; pinyin: Chénghuà; 9 December 1447 – 9 September 1487), born Zhu Jianshen, was Emperor of the Ming dynasty in China, between 1464 and 1487. His era name "Chenghua" means "accomplished change". Zhu Jianshen was a son of the Zhengtong Emperor. He was only two years old when his father was captured by the Oirat Mongols and held captive in 1449. After that his uncle, the Jingtai Emperor, took over whilst his father was put under house arrest for almost seven years. During this time, Zhu Jianshen lived under his uncle's shadow and even had his title of crown prince removed while the Jingtai Emperor installed his own son as heir. Zhu Jianshen was only reinstated as crown prince on the eve of the death of the Jingtai Emperor in 1457. The Chenghua Emperor ascended the throne at the age of 16. During the early part of his administration, he carried out new government policies to reduce tax and strengthen the Ming dynasty. However these did not last and by the closing years of his reign, governmental affairs once again fell into the hands of eunuchs, notably Wang Zhi. Peasant uprisings occurred throughout the country; however, they were violently suppressed. The Chenghua Emperor's reign was also more autocratic than his predecessors' and freedom was sharply curtailed when the emperor established institutes such as the Western Depot (to complement the existing Eastern Depot), monitoring all civilians' actions and words. This institute, not unlike a spy agency, would administer punishment to those whom they suspected of treason. The Western Depot would eventually be shut down but it was the start of a dangerous trend and the Chenghua Emperor's descendants would again revive the Western Depot during the 16th century. 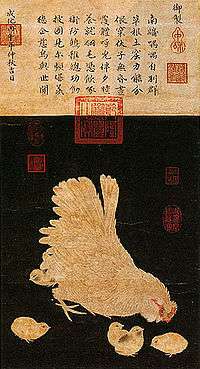 A Song dynasty (960–1279) painting of a mother hen and chicks, with a written eulogy at the top inscribed by the Chenghua Emperor describing his fondness for this work. The Chenghua Emperor was also under the influence of Lady Wan who was an imperial concubine who was seventeen years older than him. Lady Wan had been a mother figure to the young emperor but after ascending the throne she quickly became the emperor's favourite consort after giving birth to a child in 1464. Lady Wang died in 1487 and shortly after the Chenghua Emperor died in 1487, after 23 years on the throne. He was buried in the Maoling (茂陵) mausoleum of the Ming Dynasty Tombs. This painting, by an imperial court painter in 1485, depicts the Chenghua Emperor enjoying the festivities with families in the Forbidden City during the Lantern Festival. It includes acrobatic performances, operas, magic shows and setting off firecrackers. The Chenghua Emperor's reign can be distinguished by his early attempts to reform the government and trying his best to rule the country. His reign also saw a cultural flourishing with famous persons such as Hu Juren and Chen Baisha dominating the academic scene. However, the Chenghua Emperor's reign was prone to dominating individuals in the government and the emperor was easily influenced into granting favours based on who he liked rather than their abilities. This led to the degradation of the ruling class and wasteful spending by corrupt individuals which eventually depleted the Ming government's coffers. ↑ His original given name Jianjun was changed into Jianshen in 1457 when his father was restored on the throne as the Tianshun Emperor. ¹ Imperial China – 900–1800, F.W. Mote, Page 630, First Harvard University Press, 2003.